Engine room is a term used to describe the group of un-pitched percussion instruments that accompany steelbands (steel drum bands). 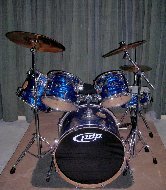 These instruments provide the timing and rhythmic drive for the entire band and are an important section in most steelbands. This section may not be necessary for all genres of music, but it is a MUST when playing popular Caribbean genres, especially calypsos. 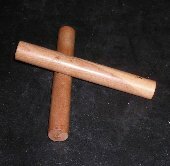 A pair of conga drums tuned in a standard fourths or fifths tuning, played with rubber tipped sticks. 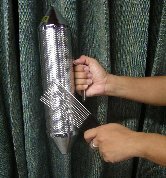 One or more irons of different relative pitches and tonal colors. 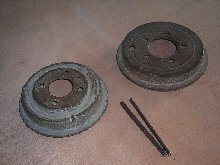 Originally discarded car brake drums played with metal beaters were used as irons. Today, irons players prefer to get their irons specially made and "tuned" to their specifications. 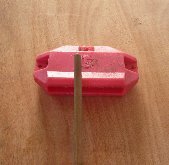 However, when single pan bands are mobile, the instruments have to be strapped the player's body. 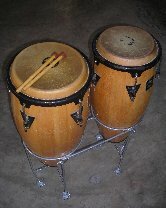 The drum kit and congas are split between two or more players while others are simply played while being held in the player's hands.